Lush, lustrous brows can be yours again, thanks to this all-natural, highly effective oil designed to encourage growth of eyebrows! Available without a prescription, the highly concentrated oil hydrates and conditions to prevent premature hair breakage, while replenishing with amino acids and peptides to keep hair and follicle healthy, eliminating clogs that prevent growth. Gentle, non-irritating formula nourishes and enhances brow health, flexibility and softness while fortifying brow base and eyebrow hair to prevent it from falling out. Hypoallergenic, non-comedogenic and suitable for women or men; simply apply directly to brows. When applied twice daily, fuller, healthier eyebrows can be yours in just 4 to 6 weeks. Proprietary formulation which includes: Mineral Oil, Sesame Oil, Hibiscus Rosa-Sinensis, Isopropyl Myristate, Rosemary Extract, Nettle Extract, Horsetail Extract, Lemon Extract, Clove Extract, Jaborandi Extract, Ginseng Extract, Pyrodoxine, Niacin, Panthenol, Amica Extract, TBHQ. Use only as directed. For external use only. Apply a small amount of Renew Eyebrow Oil Formulation to the problem area, 2 times a day. Use sparingly. For proper results apply for a minimum of 4-6 weeks. 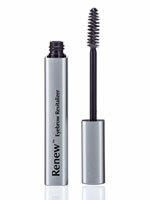 First time users should apply Renew Eyebrow Oil Formulation to a test area, such as a forearm, first. If a rash, extreme redness or itching occurs, discontinue use. For topical application only. Avoid contact with open wounds. Do not ingest. Discontinue use if rash or discomfort occurs. Do not put in eyes. Flush eye with water in case of accidental contact. Use only as directed. This eyebrow oil helps to moisturize your eyebrows and keeps them from thinning. I definitely notice a difference in the thickness of my eyebrows. something new, just want to try,,brow are so thin. Used previously with some good results. Brows are thinning as I am aging hope to see if this works. I am hoping this product will cause my eyebrows will grow back. Used it before helps with thinning brows. I am currently using this and like the product. Didn't want to run out of it.